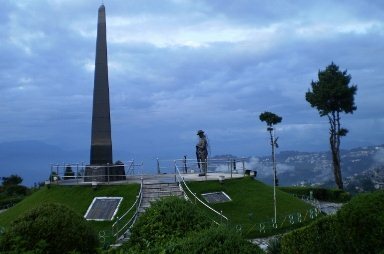 The War Memorial is located at the center of the Batasia Loop garden in Darjeeling. It has been created to honor and to serve as a memorial for the Gorkha soldiers of Darjeeling area who sacrificed their lives in various operations and wars after India's independence. Traditionally, the Gorkha Regiment has been a strong force in Indian Army where numerous Gorkha soldiers from Darjeeling hills serve the nation. There has been over 75 soldiers who have gallantly died in wars & operations following India's independence. The Zila Sainik Board of Darjeeling initiated a move to commemorate the lives of such brave souls. 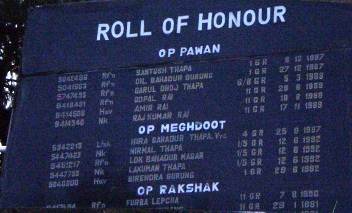 As a result a War Memorial Committee was formed with the help of Commissioner of Jalpaiguri division. The objective of the committee was to look into the proposal and also find a suitable site for the memorial. In 1984, the Batasia Loop was chosen as a suitable site. Soon during a visit of the then Defense Minister of India, the blue print of the project was shared with him. He was also requested to help with the matter so that the Indian Railways agreed to transfer the Batasia land to the Zila Sainik Board for erection of the War Memorial. The Railway Ministry agreed to transfer of the land area in the Batasia Loop that measured some 50,000 square feet. In November 1990, the Zila Sainik Board formally took over the land for a compensation of little over Rupees 46,000. By then the DGHC (Darjeeling Gorkha Hill Council) that was set up in 1988 was already fully functional. The erstwhile chairman of the council Subash Ghisingh supported the cause and a turnkey project was awarded to a private party in 1994 to construct the memorial along with some associated works. The War Memorial was completed and inaugurated on 18th April 1995. It comprises of a large raised platform which is oval in shape with a length of 37-foot and a maximum width of 24-foot. There is a triangular shape granite cenotaph in the middle which is 30-foot high. At the base of the cenotaph there is Roll of Honor with names of those who died along with the dates. Next to the cenotaph and on the same platform is a 9-foot bronze statue of a Gorkha soldier which has been created by the renowned sculptor Gautam Pal of Krishnanagar. At the approach to the site, there is a curved steel girded bridge that has been constructed and is 37-foot long, 8-foot wide and 16-foot above the railway tracks. The entire War Memorial area spanning across the Batasia Loop is some 50,000 square feet with lovely gardens having both seasonal and perennial flowers, shrubs and trees all around. Open daily from 5am to 8pm. There is a nominal admission fee of Rs. 5/- (subject to change). The entrance is the same as that of Batasia Loop. It's 5km (3.1 miles) from Darjeeling Town and located within the Batasia Loop. If you take a car or a taxi, it takes about 20 minutes from Darjeeling town to reach the War Memorial. You can also take a joy ride on a Toy Train from Darjeeling to Ghoom that leaves Darjeeling station both in the morning and in the afternoon. It stops in Batasia Loop for 10 minutes.